Reloadable cards from Visa, American Express, and the UK's Post Office replace traveler's checks. ABOVE: With a prepaid travel cash card, you're likely to whacked with two fees (a transaction charge and a "conversion fee") every time you withdraw money from an ATM overseas. Prepaid debit cards are popular with travelers as modern-day replacements for traveler's checks. 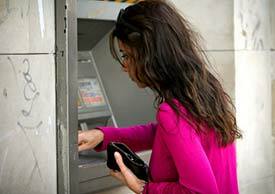 Safety is the main appeal of a prepaid travel cash card: If your card is lost or stolen, the card company will issue a new card or refund the unused balance. However, you'll pay a premium for this reassurance, especially if you use the cards to obtain foreign currency--and you'll still need to carry a credit card for occasions when the prepaid card can't be used (e.g., to secure car-rental or hotel reservations). In the U.S., Visa the best-known prepaid travel cards are issued by Visa and its partners. Fees vary from vendor to vendor, but you could pay anywhere from US $6.95 to $12.95 just to get the card, plus fees for checking your balance, withdrawing money from ATMs, etc. You may even be charged a monthly fee until you've exhausted the balance of your account. Normally, you can reload the card at the vendor's Web site or by calling a toll-free number, with reload fees that can range from several dollars to $15. Using a prepaid Visa card is like using a credit or bank debit card, and you can withdraw money from any ATM that displays the Visa logo. Another card, the American Express Serve, is similar to Visa's prepaid cards. The last time we checked, three different types of prepaid debit cards were available, so compare the options carefully (and match them to your needs) if you're tempted to spring for an Amex prepaid card. If you live in Britain, you might want to investigate the Post Office Travel Money Card Plus. The card can be loaded with a variety of currencies, and the fees are clearly explained on the Post Office's Web site. If you withdraw cash or make purchases in a currency other than the one on a prepaid travel card, you're likely to be hit with an eye-popping conversion fee in addition to the ATM transaction fee. You may even get clobbered with the fee if you make a purchase in your own currency outside your country's borders (for example, if you're an American paying in dollars on a U.S. cruise ship in international waters). Should you buy a prepaid traveler's cash card? It depends. As a rule, we'd say "No." It makes far more sense to carry a standard ATM card with a credit card as backup. If you want additional peace of mind, buy a few traveler's checks and keep them in a neck wallet or money belt. Need more money advice? See the articles below. Top photo copyright ©Jennifer Trenchard.